Thomas J. Foster established one of the earliest private, for-profit correspondence schools in Pennsylvania in the late 1880s to provide vocational training in mining, mine safety, drafting and metalworking. Spurred by the success of these efforts, he founded in 1892 the International Correspondence Schools, which became one of the largest and most enduring enterprises in this burgeoning new education industry. By 1926 there were over three hundred such schools in the United States, with an annual income of over $70 million (one and a half times the income of all colleges and universities combined), with fifty new schools being started each year. In 1924 these commercial enterprises, which catered primarily to people who sought qualifications for job advancement in business and industry, boasted of an enrollment four times that of all colleges, universities, and professional schools combined. Copyrighted courses were being developed for the firms in-house by their own staff or under contract with outside “experts,” and were administered through the mail by in-house or contract instructors. Students were recruited through advertisements and myriad promotional schemes, peddled by a field sales force employed on a commission basis. The parallels between the correspondence courses of the early twentieth century and the MOOCs (their venture-funded variety, I should be clear) are quite indicative of how we have long viewed educational “content delivery,” particularly when developed and delivered by a for-profit enterprise. Take the amount of money spent on marketers versus instructors, for example. Noble estimated that in some commercially-run correspondence schools, “less than one cent of every tuition dollar went into instruction.” Assessment was outsourced to“sub-professional” readers, who were paid on a piecework basis for each lesson they graded. He cites a 1926 survey that found that just 2.6% of students completed the correspondence courses they enrolled in. Sound familiar? But the pitch of a university – particularly from the likes of early correspondence course pioneers University of Chicago and Columbia University – is different than a pitch of a for-profit school, a difference that is always wrapped up in powerful notions of prestige and “brand.” Again, we can see echoes of this in today’s MOOCs which, despite concerns about quality that have plagued distance education throughout its history, insist that they offer “the world’s best courses” from the world’s best universities and the world’s best professors. We can trust the courses are good – the universities’ seal is on the website. And what sorts of courses – now and then? Ones that promise careers, wealth, job security, and status. 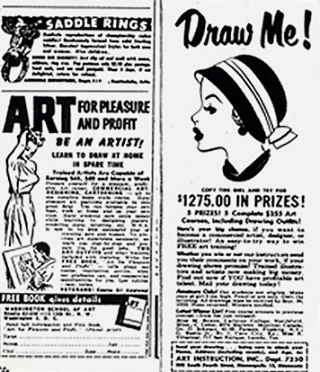 Learn to draw, at home, in your spare time – and eventually you’ll be able to make the big bucks. 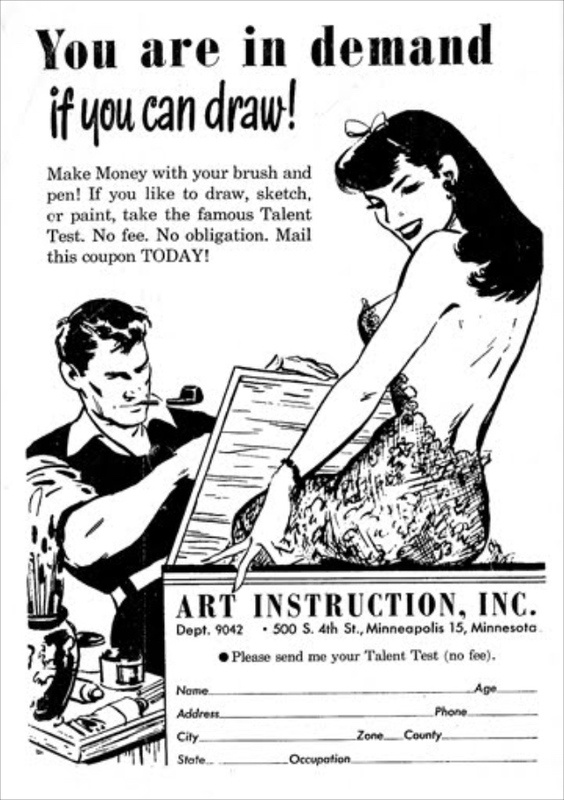 Today, the Art Instruction School remains in business. Tuition now costs $4285 – $150 down, $150 month in 27 monthly payments (plus one final payment of $85). Students still receive their lessons – 27 lessons – in the mail. They complete these “at their own pace” – “There is no travel, no hassle and no time schedule.” Lessons are sent to the school, where they are assessed and returned by mail. The school says you can call a toll-free number any time to talk to an instructor. 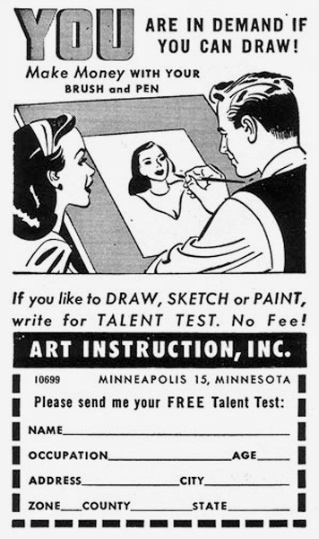 For what it’s worth, the Art Instruction School is accredited by the Accrediting Commission of the Distance Education and Training Council (DETC); and while the American Council on Education's College Credit Recommendation Service does recommend college credit for all Art Instruction School coursework, this is no guarantee that other colleges will accept it for credit. It's not necessarily the case that an employer would recognize the certificate either. 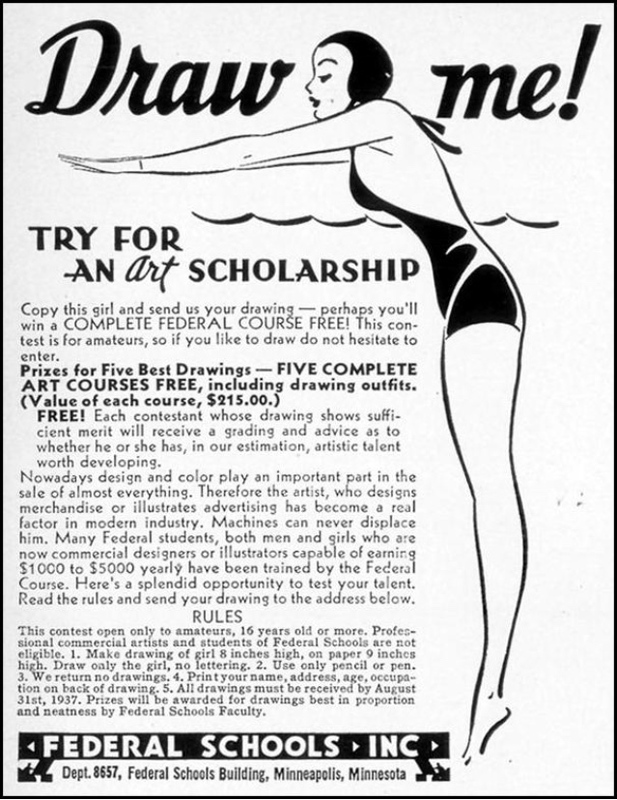 “You are in demand if you can draw!” the ad reads. Note who’s drawing. Note who’s being drawn. 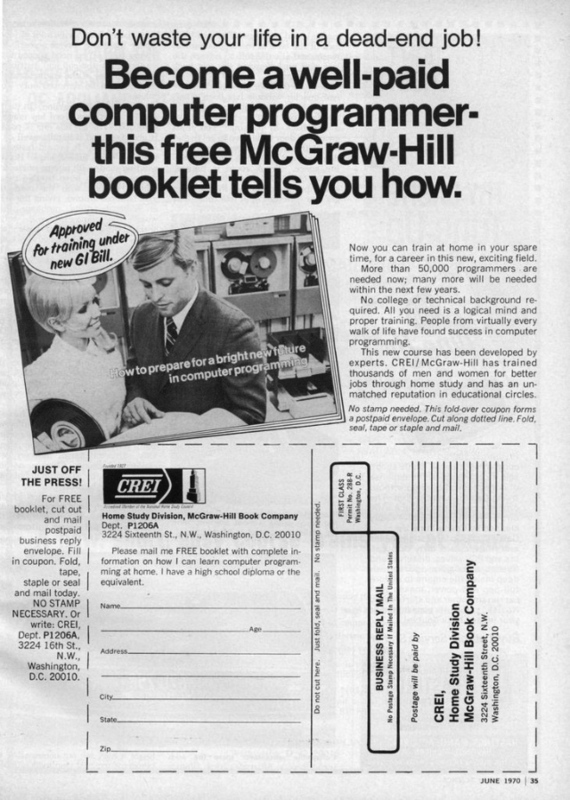 It’s hard not to see these ads and their promise of a career in the hot new field of commercial printing – and, oh my, how race and gender plays a role therein – and think of the latest version of distance education and its promise of a career in the hot new field of computer programming. Note who’s coding. Note what’s being coded.